Our bead and wire artisans are mostly economic refugees from Zimbabwe, who were attracted to the more stable neighboring economy of South Africa. Some came with the intention of making a living as artisans and some found their calling after working menial jobs. For many it was a tough start. Click here to see some of our crafters humble beginnings in South Africa. WIREWORX bead and wire artisans are fortunate to work from home and have steady income. However, most of them began their career as street vendors. Click here to meet some of the African bead and wire art street vendors and learn about the challenges they experience. Unfortunately, drug abuse is common among Zimbabweans. Many get their fix by sniffing dangerous products or from illegally acquired prescription cough medicine. No shortage of budding artisans and even some of the most talented, have destroyed their chances for a decent life due to drug abuse, making it even more difficult to find reliable and responsible help. Albert was born in Zimbabwe in 1985. 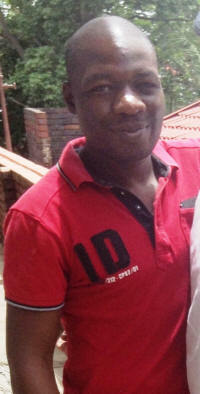 He comes from St. Mary’s, a township in the city of Chitungwiza, close to the Capital Harare. His first language is Shona and learned English in school. He is the 2ndof 5 children, 3 boys and 2 girls. Albert says that most children stay at home until they start school in 1st grade. Primary school is through 7th grade and high school is a 4 year program. While few drop out of high school, many fail and are unable to move on to career training or college. Those who pass can go on to nursing, teaching, police or army and the few that can afford it, can move on to level A for 2 years. If they pass level A they can go to college. With so many youth failing high school and few opportunities, there are many unemployed. Crime, drugs, prostitution, drunkenness and violence is part of daily life. Even the police fear entering! Albert finished high school with good grades but was unable to afford tuition to advance his education. At about the same time his father passed away, forcing him to help support the family. A year later his mother’s younger sister passed away and her infant old son became part of his family, adding 1 more mouth to feed. His mother passed away in 2010. Due to poor economic conditions and the collapse of local businesses and industries, Albert took the initiative and learned the trade of crafting with bead and wire. Albert says that many take up crafting including work in iron, bamboo, carving and painting. However, even after learning a craft, even for the more skilled crafters there is little chance of making a decent living in Zimbabwe. Many go over the border to South Africa where there is a bustling economy, easy access to materials and a large tourist market, giving then at least a chance to make a decent living. 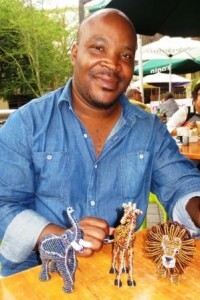 In 2006 Albert moved to South Africa to make a living from his crafts. At that time he moved in with some Zimbabwean friends already working in South Africa. In the early days, Albert was an amateur so his income didn’t provide enough to support him and what he needed to send to his family back home. He also didn’t have a residence permit so he couldn’t get a regular job. Albert’s skills improved and he was able to get more regular work, mainly from a local business. His improved financial situation enabled him to send more home. Today Albert is able to provide for his family and lives in reasonable comfort in a middle class neighborhood. He manages a group in Zimbabwe and South Africa including Stewart, Jaison, Stewart Whitehead, Simion, Tinashe, Farai, Takesure, Chagwa, Blessing & Michael. Albert returns home a few times a year, particularly when school is out. This way he can spend time with his siblings and help them out. “Working with you has really given me an edge. The work is more challenging because we are making many more designs, some of which are more detailed. We had been making fewer designs of simpler animals, key chains and ornaments. Due to this, I divide up the work among my guys based upon their skill level. Some will work on the key chains and more basic designs while the more skilled crafters will make the more detailed pieces. Congrats to Albert and Memory on their wedding!! (December 5th, 2015). I come from Zimbabwe. I was born April 20th, 1977 and am the youngest of 7, 6 boys and 1 girl. My father came to Zimbabwe from Malawi in the early 60’s for greener pastures. I went to school till form 4, which is 0 level, meaning ordinary level. Back in the day we used to write Cambridge University exams, which are still regarded as one of the top academic qualifications by most African universities. I passed with good grades but could not pursue any further studies due to financial difficulties. My father was already a pensioner in 1985 whilst I was still in the 2nd grade. He only managed to pay for our education because of the casual work he used to get because of his top skills in the clothing industry. However, in 1992 he was subsequently retrenched while I was still doing form 2 and my elder brother who was still in school doing form 4. My mother had to apply for social grant for me to be able to get to form 4. I dreamed of playing professional football (soccer) someday since I was good at it but that turned out to be just another childhood dream due to lack of proper support structures as I grew up. During my childhood I also realized that I had a talent in arts and crafts, in particular wire crafts. My parents couldn’t afford to buy me decent toys so as a group of kids we used to gather scrap wire and make our own toys such as bicycles, cars, trucks and motorbikes. Those toys became so popular in our neighborhood such that other parents, who could afford, started buying them for their own kids. This went on until such a time when cross border informal traders started stocking the toys for resale in countries like Botswana, South Africa and Namibia. With the funds I was getting from this, I could afford to buy myself soccer boots, school uniforms, stationery, go to the movies as well as chip in with some funds at home. As the need for more funds arose, I eventually came to South Africa in 2001 to work selling my bead and wire crafts. At first things didn’t go as planned. I struggled to find stalls at local markets so I resorted to making pieces for vendors who had stalls in those markets and making custom orders for their customers. In 2002 I was then introduced to a local lady who sold our products locally and abroad and things improved. I built a strong team of 8 guys. I was the designer, 2 of the team members did the framing with me and the other guys did the beading. We had a good thing going until 2004 when this lady’s primary customer decided to take all the production to China. They wanted to grow their business and chose to take advantage of the cheap and abundant labor available there and cut us out completely. They took our designs and our unique African art to be copied by a foreign people, leaving us without jobs and forcing us, the rightful owners of this African craft form, to now compete with the cheaper labor and materials in China. Fortunately, WIREWORX contacted our boss not long afterwards. Things were not good at first because they weren’t satisfied with the ordinary quality most of us were producing and that was widely available on the streets of South Africa. They wanted to raise this art form from amateur to professional and challenged us to design more detailed and accurate pieces. After some initial struggling I managed to achieve what I thought was impossible. WIREWORX had confidence in us and with their prodding we persevered. Today my skills are a cut above most due to their belief in us. In December of 2014 the lady we worked with retired and we began working directly with WIREWORX in 2015. Their orders are gradually growing and we’re learning to improve our ability to meet the demand and better manage ourselves. In early 2015 I moved my family back to Zimbabwe to give my kids a better education and with the prospect of the orders getting bigger, my wife and I look forward to furthering our education, buying a car and a piece of land on which I can build my own house since I’m renting at the moment. The Zimbabwean government is making plots of land available on the outskirts of the capital, Harare at a very reasonable price, as part of the Land Reform Initiative (Phase 4), to enable private citizens to purchase a plot of land on which to build their own homes. Tawanda’s hope to build his home on his family’s land hasn’t worked out yet he isn’t in a position to make the 40% down payment. Wireworx is providing Tawanda with an interest free loan to cover the down payment! We are there for our artisans! We hope to provide updates about Tawanda’s land purchase and the building of his home. Clarence may be small in stature but he’s a big name in the world of wire art! For many bead and wire artisans, Clarence is their go to guy for framing or to design difficult animals. Framing requires great skill and many artisans don’t have the skill level to create frames of animals with accurate proportion and detail. They turn to Clarence to do the framing while they do the beading. Tawanda and Albert, while excellent designers and framers themselves, when presented with a very difficult animals to design prefer to defer to Clarence’s unique expertise. Once he’s created the frame for a design they often take over the framing for future pieces. Unfortunately Clarence has had to deal with some personal challenges which occasionally incapacitates him for short stretches of time. Even so, over the years he’s framed a number of our more detailed animals including the mandrill, lemur, squirrel monkey, toucan, dragon, pelican, gorilla, porcupine and kangaroo. As of 2016 he’s been managing much better and has been framing many of our pieces for Tawanda and Albert. Clarence spends his time between his homeland of Zimbabwe and South Africa. Unfortunately Clarence has passed. May he rest in peace.